Paid search advertising platforms like Google AdWords and Bing Ads rely heavily on keyword targeting when determining who sees your ad and when. Your chosen keywords, after all, show Google what searches that you want to appear in. Unfortunately, traditional keyword targeting doesn’t show Google which ads you don’t want to appear in. 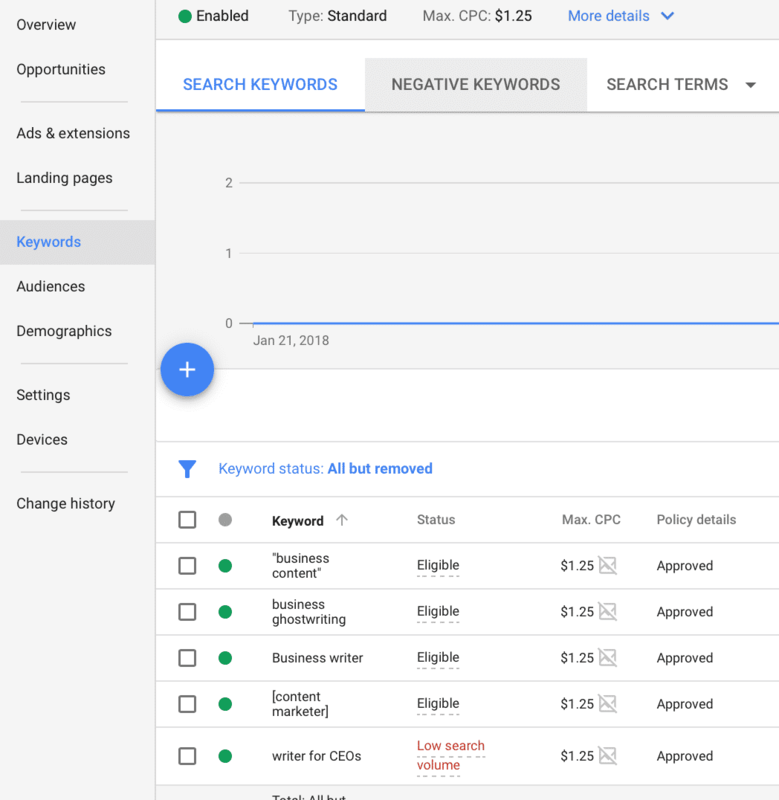 Since the default keyword match types in AdWords leaves your keywords open to interpretation from the algorithm, this can come back to haunt you unless you’re using negative keywords to counteract it. In this post, you’re going to learn everything you need to know about negative keywords, including how to create negative keyword lists, how to choose negative keywords and why we need them. On Google AdWords, there are two main types of keywords that you should consider when creating your ad campaigns. The first is the list of keywords that you want to target. The second is the optional additional negative keywords list. Your negative keywords lists contain all of the keywords that you don’t want your ads to show for. If you’re selling leather couches, for example, maybe you’d want to appear in searches for “leather couches,” “couches,” and “living room furniture,” but not in “upholstered couch.” By adding the last phrase as a negative keyword to your campaign, you could prevent your ad from appearing when users searched for that phrase. When you plug your keywords into your ad groups for your campaign, Google’s default setting is their broad match keyword type. This means that Google will try to match your ad with as many relevant searches as possible, which can result in placements that weren’t using anything close to your keyword. It’s why you’ll sometimes see ads that don’t seem to match your search result much at all. The ad below is an excellent example. 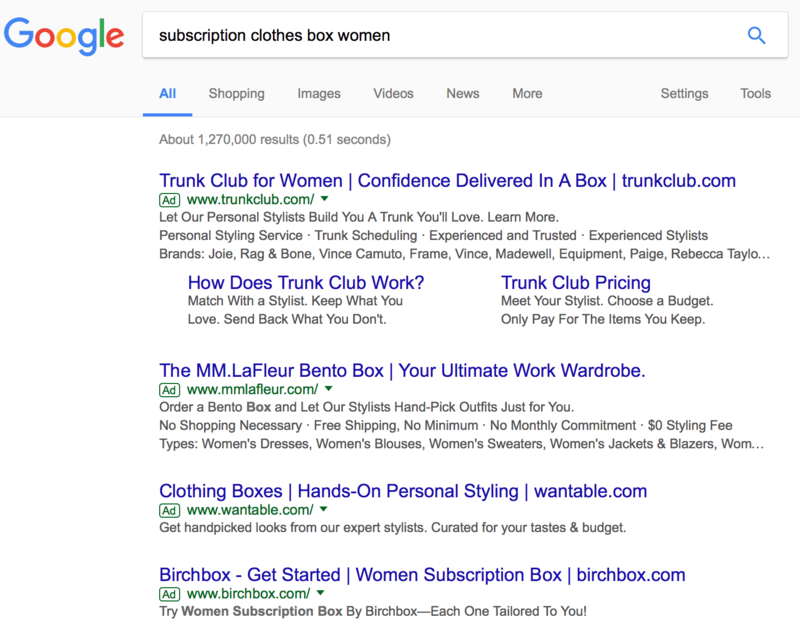 After I’ve entered in a search looking for women’s subscription clothing boxes, I see an ad for Birchbox near the bottom of the search results. Birchbox is a subscription box, but they sell beauty products and makeup—not clothes. There’s a good chance that they were targeting “subscription box for women” and Google took it from there. 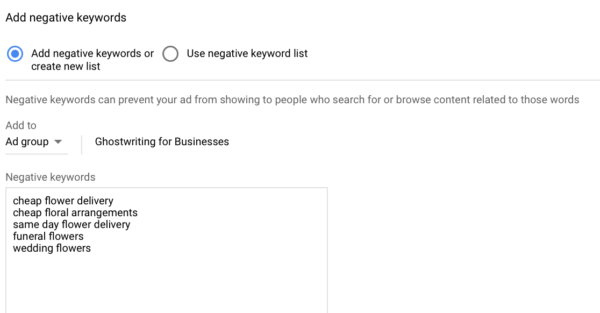 Negative keywords prevent you from showing up in irrelevant searches that the algorithm may have otherwise placed your ad in. They also help you avoid people who aren’t actually your target audience. I’m a content marketer, for example, but I wouldn’t want clients who search for “cheap content marketer” or “$5 blog posts,” because I don’t deliver either of those things. By improving the relevance of your ad placements, you can improve your click through rate and minimize ad spend that could be wasted on useless clicks. The better your keyword targeting, the less money you waste on the wrong clicks, so you literally can’t afford to let a bad interpretation of your keywords derail your campaign. 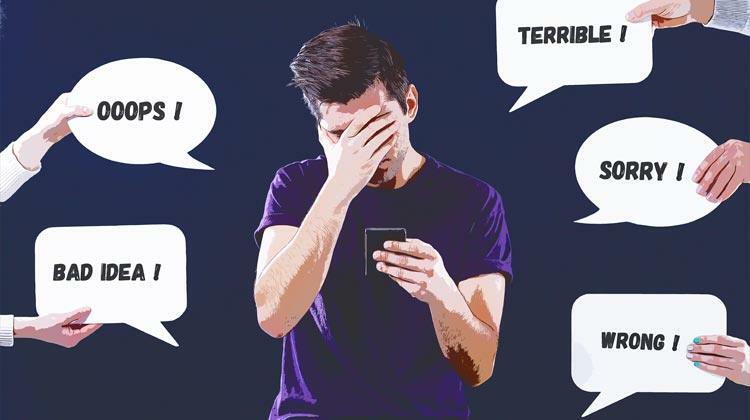 There are a few strategies you can use to discover and select which negative keywords you want to add to your campaigns. The first is making negative keyword planning part of your keyword research. When you’re using most keyword tools, including Google’s Keyword Planner, you’ll see suggestions for the term or phrase you’re researching. This will give you a lot of insight into what people are searching for in high volumes and what Google associates with your search term. You can find relevant terms that don’t match your offer or product and add them to the negative keyword list. When you enter in the search term “flower delivery,” for example, you’ll see a large number of keyword suggestions, along with their competition level, the average number of monthly searches, and the suggested bid for them. You can also use some reflection (and data) after your campaigns have been running to find additional negative keywords you want to add to the list. 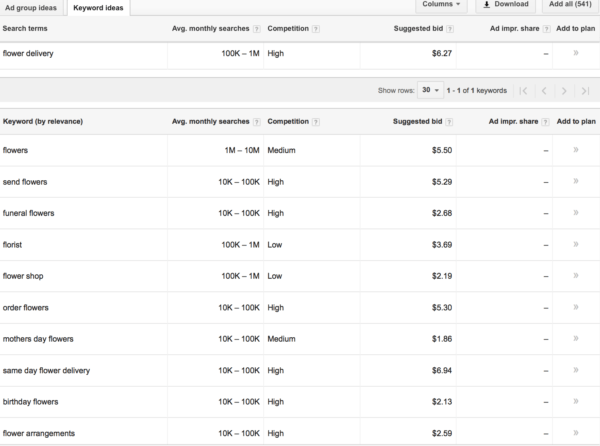 You can actually take a close look at your AdWords reports and see what search terms are triggering your ad placements. If you’re noticing a lot of clicks on “same day flower delivery” (or any other keyword you don’t want to be placing for), add it to the list as soon as possible. Not having negative keyword lists can get your campaigns off track really quickly. Fortunately, it’s exceptionally easy to create them and add them to your campaigns or your ad groups, even if they’re already running. To do this, start at the Google AdWords dashboard. You’ll see the Keywords tab listed on the navigation bar on the lefthand side. Click on it. Once you do this, you can view the keywords for each campaign or ad group you’ve created. You’ll automatically be shown the search keywords, or the keywords you’re targeting. Find the “Negative Keywords” tab towards the top of the page and click on it. If your ad group or campaign doesn’t have any negative keyword lists, you’ll see the option to create them. If you already have them, you can create more or review past lists here. Add each negative keyword that you want to avoid—you can enter as many as you’d like. 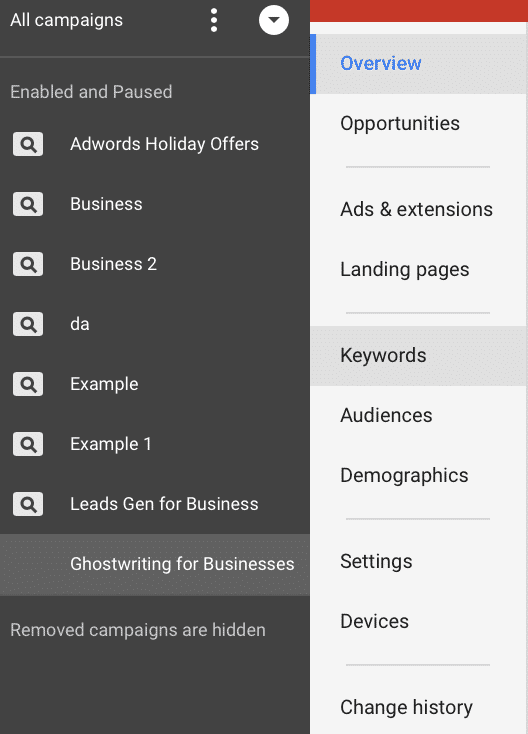 You can also choose if you’d like to apply this keyword list to an ad group or to a specific campaign. Utilizing negative keyword lists in your paid search campaigns can help you increase the accuracy of your ad placements, boost CTR and maximize every dollar you spend on your campaigns. If you notice that any of your campaigns are getting a lot of clicks from irrelevant searches, add them to your negative lists as soon as possible so it doesn’t continue to chew up ad spend and lower clicks on your ad. What do you think? Do you add negative keywords to your paid search campaigns? Have you noticed a difference in your click-through rate when you do? Share your thoughts, knowledge, and questions in the comments below.